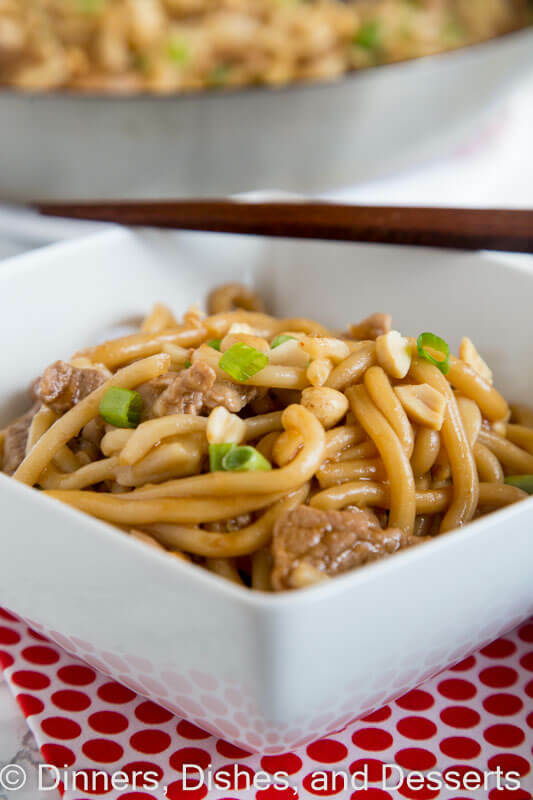 Asian Noodle Bowls with Pork – sweet, spicy, tangy, and oh so delicious! An easy dinner recipe full of so many great flavors. On the table in 30 minutes, and will disappear quickly. Welcome to 2017! This is the first post I am writing in the new year. My son has been off of school until yesterday, so I was spending time with him and enjoying some time off. Now it is back to work, and back to the kitchen. I took almost 3 weeks and just made whatever food I wanted, and didn’t photograph a thing. It was kind of crazy. 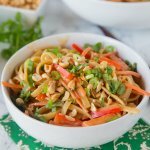 I have to say, coming back with an Asian Noodle Bowl is kind of perfect. 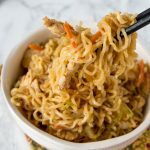 It is great comfort food for these cold nights, plus all the flavors are exactly what you need to get through the week. 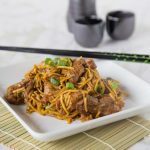 Garlic Beef Noodle Bowls have been crazy popular on the blog, so I decided to make something similar with pork, and mix up the sauce a little. 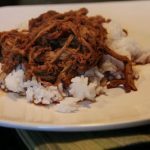 Although a straight out swap for beef and pork in both of these recipes would be amazing. 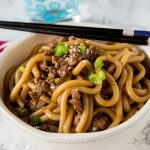 Like Mongolian Beef, so fast and easy! This is my last recipe in my partnership with Crisco. I am sad to see it end, I am a huge fan of Crisco products. I have baked with their shortening in my chocolate chip cookies since I was a kid. And the canola oil is perfect in my son’s favorite chocolate chip muffins. Which I just had to make a double batch of yesterday, so he would have a stocked freezer for back to school mornings. The first recipe I made for Crisco was Meatball Sub Egg Rolls. They would make a great addition to your Super Bowl party, check them out! Super fun idea. And then we had Grasshopper Brownies in December. 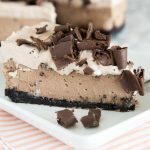 My all time favorite brownie recipe topped with mint frosting and chocolate ganche, pure heaven. So today a quick and easy dinner is in store. With people trying to eat healthier for the new year, homemade meals are a must. 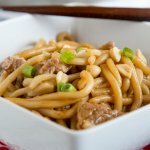 I am kind of obsessed with udon noodles, but you can use whatever you have (even spaghetti) for these Asian Noodle Bowls. 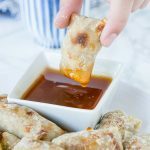 The sauce looks like a lot of ingredients, but I think you will have most of them in your pantry already. Just mix them together while the pork is cooking, and you are good to go. 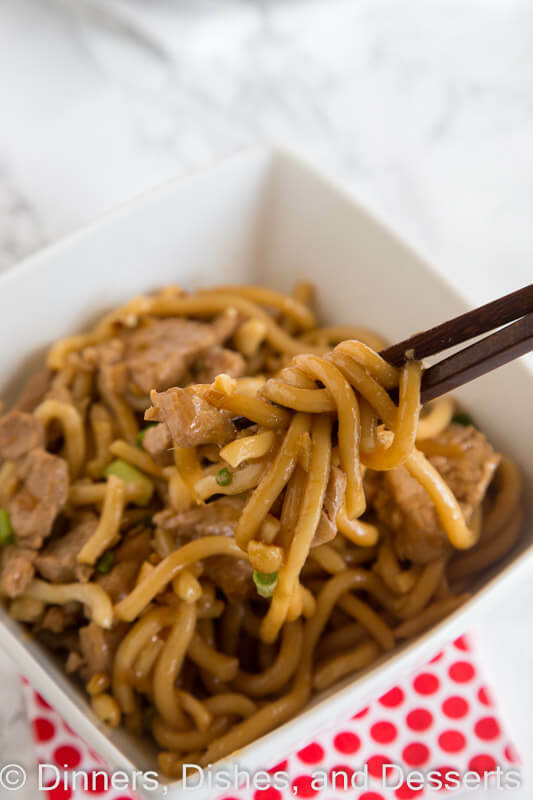 We love Asian flavors in our house, and these noodle bowls are no exception. 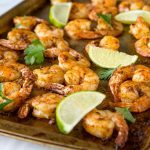 They are slightly sweet, tangy, and a little bit spicy. You can make them a lot spicy or a little, that is totally up to you. Plus the leftovers are great for lunch the next day. Or cold by the light of the fridge, no judgement here! 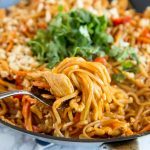 So get out those chopsticks (or a fork, whatever) and mix up these Asian Noodle Bowls for dinner, your family will thank you! 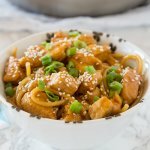 Asian Noodle Bowls with Pork - sweet, spicy, tangy, and oh so delicious! An easy dinner recipe full of so many great flavors. On the table in 30 minutes, and will disappear quickly. In a large skillet, heat oil over medium high heat. Add pork tenderloin and onions to the pan. Cook for 3-5 minutes until the pork is browned, and the onions are soft. Add garlic, and cook for 1 minutes. Meanwhile mix all of the ingredients for the sauce together, and whisk until combined. Pour the sauce mixture over the pork. Mix together, and simmer for 3-5 minutes until sauce thickens slightly. Add cooked noodles to the pan, tossing to coat. 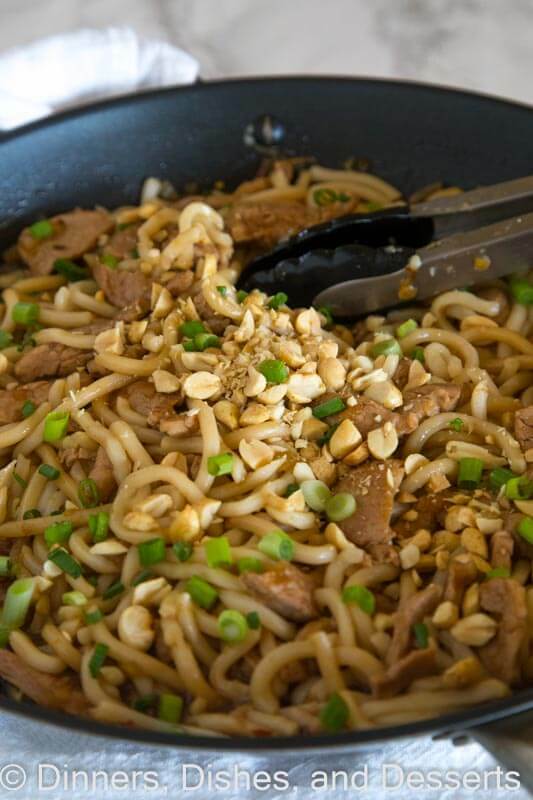 Serve immediately topped with chopped peanuts and green onions. **This post is sponsored by Crisco. I was compensated for my time to create this recipe. All thoughts and opinions are 100% my own. 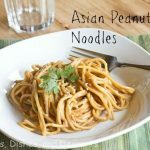 Udon and peanut : perfect combination ! Thank you and have a pleasant day ! 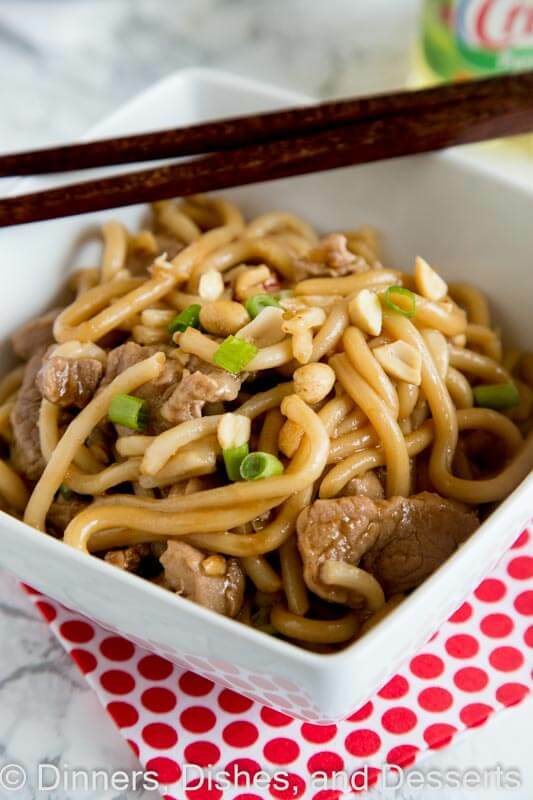 These noodles look perfect for Chinese New Year. Definitely adding to my menu! A new favorite dinner in my house! SO good! I made this last week for dinner, so flavorful! 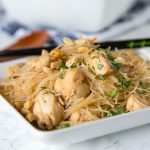 This is such a family friendly dish! My kids cleaned thier plates with no hesitation. What a great dinner option! Looks so easy to get on the table. 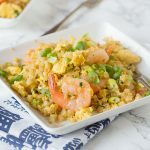 This is such a great weeknight dinner option! Delicious and quick! Love the sweet and spicy flavor! I love this flavor! Also love how simple it sounds to make, may just try this! I love how tasty this is! 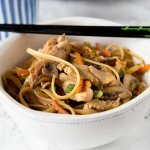 A new favorite meal in my house!